I'm not knowledgable about electronics or speaker design so I hope someone here has the patience to answer my naive questions. I've "blown"? the bass driver on one of my New Advent 5012 speakers. By "blown" I mean that it rattles on low frequency, high volume sounds. This happened after I hooked my amp/TV/computer together and fired up a youtube that about blew the house apart when it started up. Stupid me, for not zero-ing the amp volume first. The speaker still sounds OK if not asked to handle low notes at much volume - like the terriying roar of the blown-out BP well on the film about the Deepwater Horizon :(. - Will I damage it further if I keep using it at rattle-fee levels? - In layman's terms what's the most likely physical nature of the damage? - Am I wrong in thinking it's not practically repairable? It's possible that just buying modern small speakers (how do they GET that sound) would be the simplest or most practical solution but I'm strongly opposed to dumping a speaker set if 3/4 of it is working just fine. Apologies if my questions are less than interesting to the more technically advanced majority here; and thanks in advance, for any help/advice. - Will I damage it further if I keep using it at rattle-fee levels? Yes you will most likely. - Am I wrong in thinking it's not practically repairable? Yes, you are wrong. - Can I replace it with a non-identical woofer that's relatively inexpensive; and not hear much difference? (** See below) Depends on how critically you listen. Its easier to replace with identical which are easy to find. Remove the grill to see if the foam surround is cracked or broken. This might be your only problem which can be easily repaired by you or someone competent. Worst case is voice coil is gone and you need replacement woofer. An Advent expert will be along eventually when the holiday weekend is over. Posting a picture of the woofers would be of help. I was alerted to the need for foam replacement, and did that, a couple years ago. I feel sure you're right in suggesting the voice coil is damaged. Not sure whether you're saying that's (easily/economically) repairable? Pushing on the cone produces a rasping or scraping sound. I've been able to confirm (by ear) that it's only one of my woofers that's damaged; i.e.only one can be made to rattle. Edzll just noticed you were on Vancouver Island. Adams, can you give me references to the site(s) where these identical replacements show up? It would be great if I can get one. Edzll Check your Private Messages.
" The nominally 10-inch-diameter paper cone (which has an actual radiating diameter of just under 8 inches) is driven by a 1-1/2-inch voice coil whose nominal impedance is 8 ohms. The woofer operates in a sealed cabinet made of walnut-grain vinyl-clad particle board; the smoothly rounded front edges give it the appearance of a wood-veneered cabinet. The speaker can be mounted either horizontally or vertically, against a wall or on the floor. Advent encourages experimentation to find the sonically best location." If you can hang on till Tuesday the real Advent experts will probably be back. Oh, so my confusion is over nomenclature? That could explain a lot. I'm off to take the grill cloth back off and get you a photo. The overall dimension of the odd-shaped face plate is about 11 inches. Here is the one for sale. There are at least hundreds of these for sale new and used. This one is for sale in Sacremento. That surely is the one. Thank you so much for clearing up my confusion. I'd found some before but thought they were the wrong size, meant for some other Advent "box." We're going out for the evening - a previously booked free dinner for local old farts; can't miss it! You've been very helpful, and not easily discouraged. When I had Advents it seemed like these drivers were everywhere. When I look now all that are for sale are in the cabinet. My "hundreds for sale" statement was incorrect,at least for today. So now I have another question (of course!) - When people talk about "large Advent" speakers are they actually referring to the same ones I have, in a cabinet about 11-3/4" x 14-1/2" x 26-1/2" high? They were called "New Advent" when I bought them, and are so labelled at lower left front. I've been dismissing ads for Large Advent drivers because I imagined "large Advents" must be something different from mine - which Advent themselves called "New Advent." Oh but wait; I just saw an illustration on line, looks like mine, but the plaque just says "Advent," not "New Advent." It seems any technical problems might be easier to sort out than those of inconsistent naming & maybe unclear communication. But isn't it ever so?? It can get quite frustrating. I'll likely feel better about it in the morning; especially in view of the fact that folks on here are so very, very helpful. Time for a nightcap (Rusty Nail) then bed. They are talking about a long line of speakers that are very similar. Your woofer is the same one used in several models of Advent speakers of which maybe a million pairs were sold. If you see a woofer that looks like yours it will probably work in your 5012. You cannot use the woofer from the original large Advent (OLA) the real name of which was The Advent Loudspeaker. 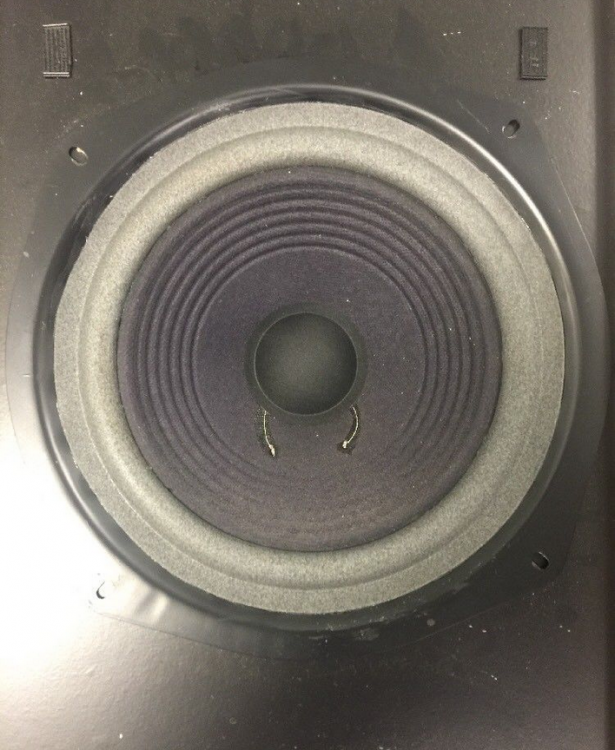 Later Advent products like the Legacy series did not employ your woofer but in general if it looks yours and is dimensionally the same it will work. Again I am not the Advent expert here. If "Large Advent" is mentioned - or OLA - it has a different bass speaker than my 5012s; Not necessarily. If "large advent" is mentioned it could be either. The real OLA woofer is very obviously not like yours. Yes, I now appreciate more, why you asked for a photo. Best bet may be to watch ebay. Re-foamed NLA woofers have sold from about $25 to about $45 USD each. A little patience should pay off. Just make sure you see an image before you buy. If your vision is legal for driving you can see the difference at 50ft. It would be difficult to confuse them. "If your vision is legal for driving you can see the difference at 50ft." Haha, yes. But I often see the speakers described as not only 'Small Advents' but also 'bookshelf speakers' ??? They wouldn't be supported by any bookshelves I've ever owned; although I did at one time have the courage to wall-hang then with very strong picture wire. Despite claims that "walnut vinyl" is the most handsome cabinet finish of all, let me tell you that mine are finished with blond oak veneer - not vinyl - and are THE most handsome that anyone could possibly imagine! I may get around to providing photo evidence of their beauty. They were bought in Prince George, B.C. in the very early 80s. Hmm. Maybe a pair of oak veneered New Advents is so rare as to be worth thousands ?? or not. Right now I'm not finding that recognisable-at-50-feet woofer except maybe the one in Sacramento. It's recognisable from the front but in the back view has a different round & domed magnet (mine is square & flat, with no identifying marks I think.) And the Sacramento one is described as 10" woofer in 12" frame, which tends to confuse me further. (Kent - same goes for one of those you pointed to; and the one that you were dubious about is definitely not a drop-in replacement .) Also there is some inconsistency about advertised impedance - 8 ohms or 6? As an irrelevant aside, the mounting holes in my drivers are plain round holes that fit the screws quite snugly. The pictures I see of (later?) drivers have slotted holes. Was this a sign of deteriorating quality control, requiring some assembly tolerance? I'm joking really, but mine really are not slotted. This thread is getting pretty long (I'm not complaining) so I think I'll start a fresh topic simply asking if anyone has, or can point me to, the correct driver for sale. The speaker still sounds OK if not asked to handle low notes at much volume - like the terriying roar of the blown-out BP well on the film about the Deepwater Horizon :(. Edzll this is an OLA woofer. It cannot be confused with yours. Purists will note this one has an incorrect dust cover but you should focus on the brown masonite ring. ALL OLA woofers have a masonite ring. Thanks A(a)dams. By now, mostly thanks to yourself, I've got a pretty good feel for which advertised drivers are the one I need, which ones are definitely not, and which ones I need more info about. - including front & rear photos, preferably with illustrated front measurements. I'm getting advice from several folks now - thanks all - so I'll just mostly address myself to the forum; maybe repeating a few things I said before that have been skipped over :). The driver in question makes horrid rattling noises on loud low-frequencies after being accidentally subjected to a burst of ear-shattering noise. If I push on the cone it makes a scraping noise. I'm on Vancouver Island so US postage & dollar premium - ours is $0.80 - could be an issue in pricing repairs/replacement. Closest repair guy I can find online is in Victoria; about 3 hr drive south so not too bad but I don't know beans about him. I won't consider 'D.I.M.yself' speaker repairs.